Last summer we lost a member of our community whose suicide and bizarre past and story left us all stunned – a story shrouded in mystery with questions we will never find answers to or understand. 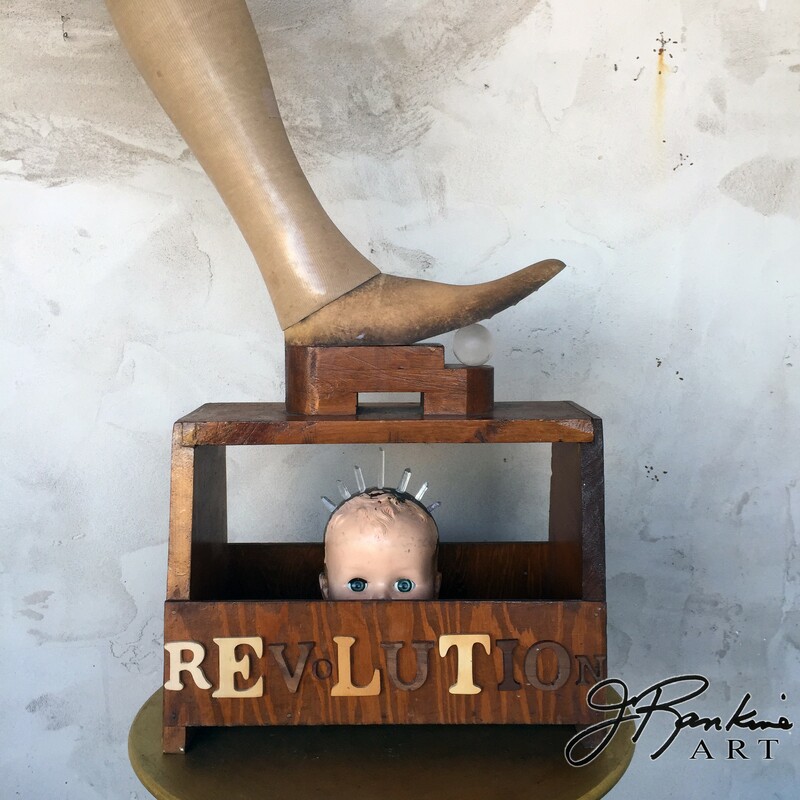 Two months before she died, M arrived at my studio with a present– an antique, wooden, prosthetic leg. 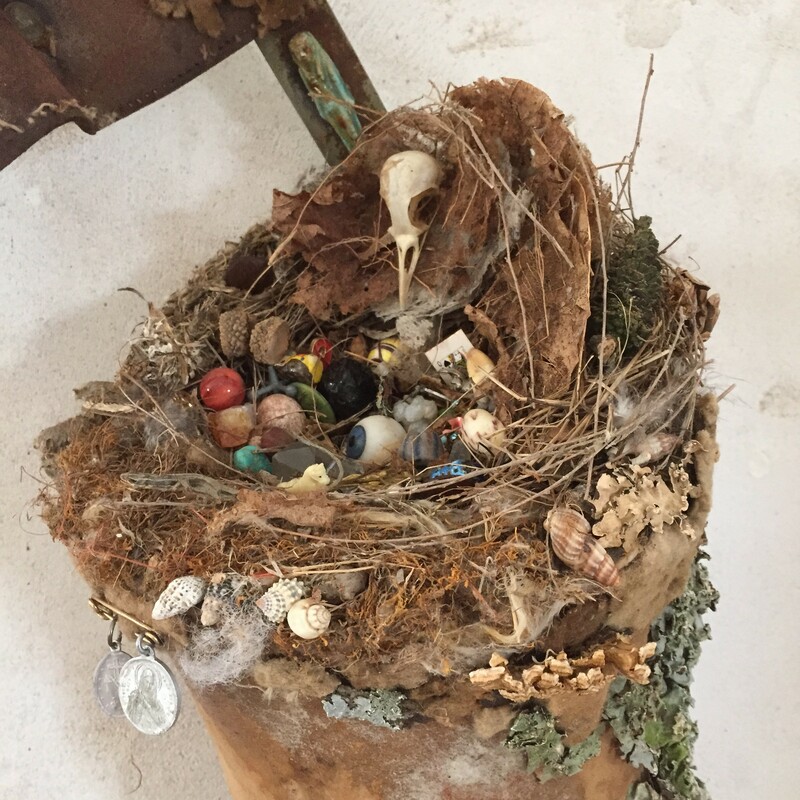 The leg had been in storage and the remnants of a packrats nest remained inside the hollow wooden structure. 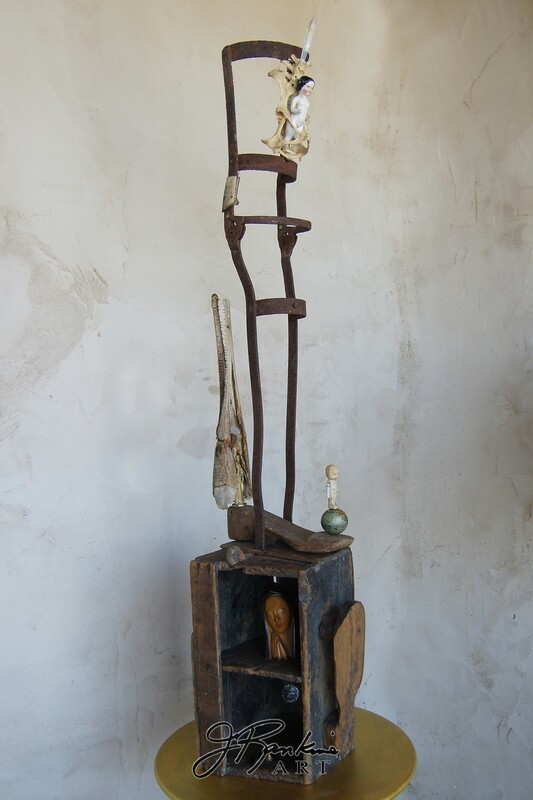 M had seen the series of found object assemblages I had been working on comprised of artificial legs, rusted braces and old shoeshine boxes. She knew how much I would treasure the leg and was overjoyed when presenting it. It sat upright leaning against my studio wall for months, a reminder of M, her life and death, and the fragility of it all. Several creative attempts were made to work with the leg to no avail, until last month, when a small wooden letter “m” materialized. Without hesitation the letter was glued onto the leg and my commitment to the piece commenced. “M” will be part of The Word, a group exhibit where I asked 14 other artists to create work that simply incorporated a word or words in their piece. The show will be on display at Brews in Eureka Springs, AR with an opening reception Feb. 11, from 5 to 8 p.m. and run until Mar. 30. Brews is located a 2 Pine St. across from the Eureka Springs post office. Very nice, sorry about your friend. I love you art John!